What is TypeHello and How Does it Work? Imagine the internet as a virtual world that resembles everyday life Every website signifies a street, a store, or location where you can go and interact with other individuals. Whenever you change websites, you are traveling through this world, arriving at new locations, and encountering new people. The internet is no longer a collection of websites, but rather a mirror image of our world, where people have the ability to openly communicate with each other. TypeHello is a program that turns that vision into reality by allowing you to talk to anyone who is using the same website as you. All you have to do is launch TypeHello on your favorite Internet browser, and click the “chat on current website” button. It is that simple. So let’s say you are a sports fan, just go on espn.com, click the “chat on current website” button, and you are free to talk to anyone on that website. Have you ever met someone that really gets under your skin? A person so annoying that you just wish would disappear, but there is nothing you can do about it. Well, when you use Typehello, you will never face that problem because you can just click the nudnike menu, select ignore person and that guy will never bother you again. Often times, someone will consider you their friend, but to you they are just an acquaintance. That is why TypeHello does not use the traditional friend request method where you have to confirm a friendship once someone adds you. Instead, anyone can add you as a friend and if you choose not to add them back then you two will become acquaintances Acquaintances will be visible to each other and will have the ability to talk at any time. To begin working with TypeHello, you will need to install both Silverlight and the Plugin. Go to typehello.com and click on the image of your favorite browser. The program will begin installing and everything else should happen automatically. As of today, we do not support proxy, but we will continue working on that. 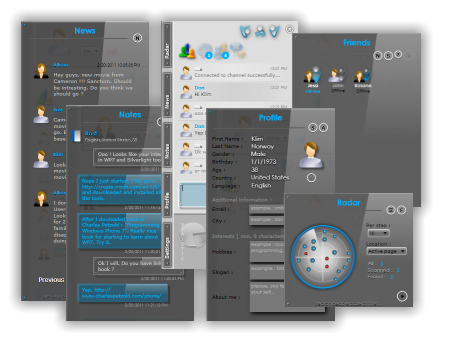 This web communicator is our attempt at combining the idea of a virtual world with the full experience of social networks, chat rooms and instant messengers. We hope you enjoy it and don’t forget to type hello.